Who Is Alan R. Pinkus? Dr. Alan R. Pinkus was a Senior Engineering Research Psychologist who, after working at Systems Research Laboratories, began his Federal career as an ergonomic specialist for the Aeronautical Systems Division, Wright-Patterson AFB, Ohio, in 1982. As a human factors engineer, he worked on major weapon systems including LANTIRN, KE-3, Gunship 2, Air Force One, & the E-8 Joint STARS. While at that position, he also developed the Mil-Prime Specification for Interior & Exterior Aircraft Lighting. In 1986 he transferred to Armstrong Laboratory as a research psychologist concentrating on applied vision challenges. As a researcher, he worked in the areas of image display metrics, night vision goggles, apparent motion models, aircraft lighting, transparency analysis, test method standardization, vision from space, & the visual psychophysics of multispectral image enhancement. A large portion of his work focused on integration issues for night vision goggles & aerospace transparencies. Also during this time period, he earned his PhD in Experimental Psychology from Miami University. 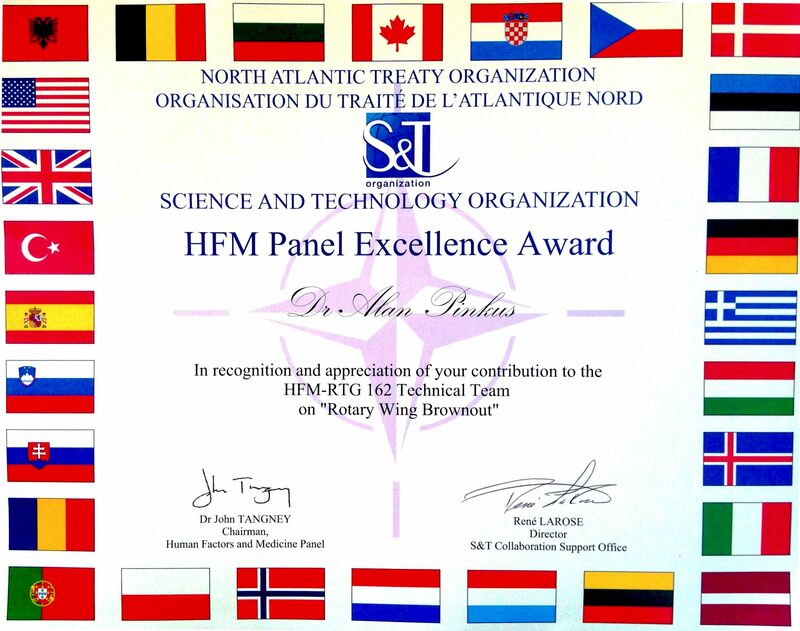 Alan has lectured multiple times in Europe & Asia for NATO on the topics of night vision goggle human factors integration, aircraft lighting, display analysis, & rotary-wing brownout mitigation. He received the USAF Science & Engineering Award in 1999 for his significant contributions to the testing & integration of night vision goggles with advanced weapon systems. Dr. Pinkus was presented with the Award of Merit from & was made a Fellow of the American Society for Testing & Materials International in 2004 for his committee work in the development & publishing of multiple test standards. He also was given the NATO Science & Technology Organization, Human Factors Medical Panel Excellence Award for work on "Rotary-wing Brownout Mitigation: Technologies & Training," in 2014. His most recent research efforts were in the areas of multispectral imaging systems, human visual performance test methodologies for digital image fusion, visual search paradigms, & vision through the atmosphere modeling. He has 90 publications & 29 patents. After eight years as a contractor & 35 years of Federal service, both for the United States Air Force, Alan happily retired on January 3, 2017. ▪ PhD - Experimental Psychology, Miami University, 1992. Dissertation, "The spatiotemporal characteristics of visual motion priming." ▪ MA - Experimental Psychology, University of Dayton, 1980. Thesis, "The effects of color & contrast on target recognition performance using monochromatic television displays." ▪ BS - Experimental Psychology, Wright State University, 1974. ▪ Pinkus, A. R., Dommett, D. W., & Task, H. L. (2016). Evaluation of the Repeatability of a Landolt-C Based, Automated Sensor Resolution Assessment Methodology. Proc SPIE, Vol. 9842-35. ▪ Toet, A., Hogervorst, M. A., & Pinkus, A .R. (2016). The TRICLOBS Dynamic Multi-band Image Data Set for the Development and Evaluation of Image Fusion Methods. Public Library of Science (PLOS ONE), http://dx.doi.org/10.6084/m9.figshare.3206887. ▪ Geiselman, E. E., Pinkus, A. R., Haggit, J. M., & Task, H. L. (2015). Assessment of Proposed Cab Glass Coating for FAA Control Towers. (Report No. AFRL-RH-WP-TR-2015-0074). Wright-Patterson AFB, OH: Air Force Research Laboratory. ▪ Pinkus, A. R., Garrett, J. S., Paul, T. M., & Pantle, A. J. (2015). Effects of the experimental manipulation of Fourier components of naturalistic imagery on search performance and eye-tracking behavior. Proc SPIE, Vol. 9474-34 S7. ▪ McIntire, J.P., Havig, P. R., & Pinkus, A. R. (2015). A Guide for Human Factors Research with Stereoscopic 3D Displays. Proc SPIE, Vol. 9470A-9 S3. ▪ Geiselman, E. E., Pinkus, A. R., Garrett, J. S., & Task, H. L. (2013). Evaluation of Proposed Cab Glass Coating for FAA Control Towers. (AFRL-RH-WP-TR-2013-0123). Wright-Patterson AFB, OH: Air Force Research Laboratory. ▪ Pinkus, A. R., Dommett, D. W., & Task, H. L. (2013). A comparison of sensor resolution assessment by human vision versus custom software for Landolt C and triangle resolution targets. Proc SPIE, Vol. 8745-38. ▪ Task, H. L., Pinkus, A. R., & Geiselman, E. E. (2013). Development of a real-world, sensor-aided target acquisition model based on human visual performance with a Landolt C. Proc SPIE, Vol. 8745-39. ▪ Pinkus, A. R., Poteet, M. J., & Pantle, A. J. (2013). Search performance with discrete-cell stimulus arrays: filtered naturalistic images and probabilistic markers. Psychological Research, Vol. 77, 277-302. ▪ Ellis, S. A., Pinkus, A. R., & Task, H. L. (2012). Assessment of refueling hose visibility. (AFRL-RH-WP​-TR-2012-0​145). Wright-Patterson AFB, OH: Air Force Research Laboratory. ▪ Pinkus, A. R., Dommett, D. W., & Task, H. L. (2012). A Comparison of Landolt C & triangle resolution targets using the synthetic observer approach to sensor resolution assessment. Proc SPIE, Vol. 8392-45. ▪ Albery, W., et al. (2012). Rotary-wing Brownout Mitigation: Technologies & Training. NATO-OTAN RTO-TR-HFM-162. ▪ Pinkus, A. R., Dommett, D., & Task, H. L. (2011). A Comparison of synthetic & human observer approaches to multispectral sensor resolution assessment. Proc SPIE, Vol. 8042B-30. ▪ Pinkus, A. R., Task, H. L., & Unger, S. E. (2010). Quad-Emissive Display for Multi-Spectral Sensor Analysis. (AFRL-RH-WP-TR-2010-0123). Wright-Patterson AFB, OH: Air Force Research Laboratory. ▪ Pinkus, A. R., Dommett, D., & Task, H. L. (2010). Synthetic observer approach to multispectral sensor resolution assessment. Proc SPIE, Vol. 7689-14. ▪ Pinkus, A. R., Dommett, D. & Task, H. L., Unger, S., and Sivert, D. (2010). Synthetic observer approach to multispectral sensor resolution assessment. (AFRL-RH-WP-TR-2010-0113). Wright-Patterson AFB, OH: Air Force Research Laboratory. ▪ Pinkus, A. R., Toet, A., & Task, H. L. (2010). Object Recognition Methodology for the Assessment of Multi-spectral Fusion Algorithms: Phase I. (AFRL-RH-WP-TR-2010-0075). Wright-Patterson AFB, OH: Air Force Research Laboratory. ▪ Repperger, D. W., Pinkus, A. R., Farris, K. A., Roberts, R.G., & Sorkin, R.D. (2009). Image Fusion Using Registration & SVD Algorithms. NAECON, July 21-23. ▪ Rash, C. E., Russo, M. B., Letowski, T. R., & Schmeisser, E. T. Editors. (2009). Helmet-mounted Displays: Sensation, Perception, and Cognition Issues . Chapter 10 Visual Perception & Cognitive Performance & Chapter 12 Visual Perceptual Conflicts & Illusions. ▪ Pinkus, A. R., Toet, A., & Task, H. L. (2009). A Continuous Motion Object Recognition Methodology for the Assessment of Multi-spectral Fusion Algorithms. Proceedings of SPIE, Orlando, FL, Vol. 7336-35. ▪ Pinkus, A. R., & Task, H. L. (2009). Quad-Emissive Display for Multi-spectral Sensor Analyses. Proceedings of SPIE, Orlando, FL, Vol. 7336-50. ▪ Neriani, K. E., Pinkus, A. R., & Dommett, D. W. (2009). An investigation of image fusion algorithms using a visual performance-based image evaluation methodology. (AFRL-HE-WP-TR-2009-0015). Wright-Patterson AFB, OH: Air Force Research Laboratory. ▪ Leger, A., et al. (2008). Common Methodological Basis for Evaluation & Testing of Visionic Device. NATO-OTAN RTO/RTG-027 Technical Working Group. ▪ Martinsen, G. L., Hosket, J. S., & Pinkus, A. R. (2008). Correlating military operators visual demands with multispectral image fusion. Proceedings of SPIE, Orlando, FL, Vol. 6968-64. ▪ Neriani, K. E., Pinkus, A. R., & Dommett, D. W. (2008). An investigation of image fusion algorithms using a visual performance-based image evaluation methodology. Proceedings of SPIE, Orlando, FL, Vol. 6968-44. ▪ Demiryont, H., Shannon III, K. C., Dixon, S., & Pinkus, A. (2008). All solid-state electrochromic device for helmet-mounted displays. Proceedings of SPIE, Orlando, FL, Vol. 6955-6. ▪ Pinkus, A. R., Poteet, M. J., & Pantle, A. J. (2008). Dynamic stimulus enhancement with Gabor-based filtered images. Proceedings of SPIE, Orlando, FL, Vol. 6968-63. ▪ Task, H. L., & Pinkus, A. R. (2007). FAA air traffic control tower cab glass evaluation, specification & assessment with respect to optical-visual characteristics. (AFRL-HE-WP-TR-2007-0094). Wright-Patterson AFB, OH: Air Force Research Laboratory. ▪ Pinkus, A. R., & Task, H. L. (2007). Applied & theoretical aspects of night vision goggle resolution & visual acuity assessment. NATO-OTAN RTO-MP-HFM-141. ▪ Task, H. L., & Pinkus, A. R. (2007). Theoretical & Applied aspects of night vision goggle resolution & visual acuity assessment. Helmet- & Helmet-Mounted Displays: Technologies & Applications, Proceedings of SPIE, Orlando FL, Vol. 6557, 65570P-1-11. ▪ Repperger, D. W., Pinkus, A. R., Skipper, J. A., & Schrider, C. D. (2007). Object Recognition Via Information-Theoretic Measures/Metrics. Proceedings of SPIE, Vol. 6498, 64980Z-1-12. ▪ Repperger, D. W., Pinkus, A. R., Skipper, J. A., & Schrider, C. D. (2007). Object Recognition Via Information-Theoretic Measures/Metrics. (AFRL-HE-WP-TP-2007-0003). Wright-Patterson AFB, OH: Air Force Research Laboratory. ▪ Repperger, D. W., Pinkus, A. R., Skipper, J. A., & Schrider, C. D. (2007). Stochastic Resonance Investigation of Object Detection in Images. Proceedings of SPIE, Vol. 6497, 649703-1-12. ▪ Repperger, D. W., Pinkus, A. R., Skipper, J. A., & Schrider, C. D. (2006). Stochastic Resonance Investigation of Object Detection in Images. (AFRL-HE-WP-TP-2007-0002). Wright-Patterson AFB, OH: Air Force Research Laboratory. ▪ Leger, A., et al. (2006). Toward Recommended Methods for Testing & Evaluation of EV & E/SV Based Visionic Devices. NATO-OTAN RTO-MP-HFM-125. ▪ Reis, G. A., Pinkus, A. R., & Neriani, K. E. (2006). Psychometric Correlates of the Effects of Image-Enhancing Algorithms On Visual Performance. (AFRL-HE-WP-TR-2006-0040). Wright-Patterson AFB, OH: Air Force Research Laboratory. ▪ Neriani, K. E., Herbranson, T. J., Reis, G. A., Pinkus, A. R., & Goodyear, C. D. (2006). Visual Performance-based Image Enhancement Methodology: An Investigation of Contrast Enhancement Algorithms. (AFRL-HE-WP-TR-2006-0052). Wright-Patterson AFB, OH: Air Force Research Laboratory. ▪ Neriani, K. E., Herbranson, T. J., Reis, G. A., Pinkus, A. R., & Goodyear, C. D. (2006). Visual Performance-based Image Enhancement Methodology: An Investigation of Contrast Enhancement Algorithms. Enhanced & Synthetic Vision, Proceedings of SPIE, Orlando FL, Vol. 6226, 6226-06. ▪ Reis, G. A., Neriani, K. E., Pinkus, A. R., & Heft, E. L. (2006). Psychometric Correlates of the Effects of Image-Enhancing Algorithms On Visual Performance. Enhanced & Synthetic Vision, Proceedings of SPIE, Orlando FL, Vol. 6226, 6226-24. ▪ Repperger, D. W., Pinkus, A. R., & Koepke, C. G. (2006). A Study of Visual Search Algorithms in Compromised Images. AIAA 31st Annual Dayton-Cincinnati Aerospace Science Symposium. ▪ Repperger, D. W., & Pinkus, A. R. (2006). Optimization to Improve Detectability - A Study Using Information Theoretic Means. AIAA 31st Annual Dayton-Cincinnati Aerospace Science Symposium. ▪ Pinkus, A. R., & Rash, C. E. (2006). A Unified Taxonomic Approach to the Laboratory Assessment of Visionic Devices. Helmet- & Helmet-Mounted Displays: Technologies & Applications, Proceedings of SPIE, Orlando FL, Vol. 6224, 6224-06. ▪ Rash, C. E., & Pinkus, A. R. (2006). A Unified Approach to the Laboratory Assessment of Visionic Devices. NATO-OTAN Workshop, Williamsburg VA.
▪ Pinkus, A. R., Task, H. L., Hausmann, M. A., & Barbato, M. H. (2005). The Visual-Acuity-Based, Night Vision Goggle Cockpit Lighting Compatibility Field Evaluation Test Kit; A Low-Cost Alternative. (AFRL-HE-WP-TR-2005-0102). Wright-Patterson AFB, OH: Air Force Research Laboratory. ▪ Task, H. L., Pinkus, A. R., Barbato, M. H., & Hausmann, M. A. (2005). Night Vision Imaging System (NVIS) Lighting Evaluation Methodology. Proceedings of SPIE, Orlando FL, Vol. 5800, 45-54. ▪ Neriani, K. E., Herbranson, T. J., Pinkus, A. R., Task, C. M., & Task, H. L. (2005). Visual Performance-based Image Enhancement Assessment Methodology: An investigation of three Retinex algorithms. Proceedings of SPIE, Orlando FL, Vol. 5802, 92-101. ▪ Task, H. L., Pinkus, A. R., Barbato, M. H., & Hausmann, M. A. (2004). Night Vision Imaging System Lighting Compatibility Assessment Methodology: Part 2. FAA Aviation Maintenance, General Aviation, & Vertical Flight Human Factors. Washington D.C.
▪ Pinkus, A. R., Task, H. L., Hausmann, M. A., Barbato, M. H., & Goodyear, C. D. (2004). Dynamic Visual Acuity Assessment through Visors. (AFRL-HE-WP-TR-2004-0118). Wright-Patterson AFB, OH: Air Force Research Laboratory. ▪ Pinkus, A. R., & Task, H. L. (2004). Night Vision Goggle Luminance Disparity & the Pulfrich Phenomenon. Proceedings of SPIE, Orlando FL, Vol. 5442, 54-63. ▪ Mecham, J. B., & Pinkus, A. R. (2004). Self-Assembled Variable Transmittance Helmet-Mounted Display Visor. (AFRL-HE-WP-TR-2004-0029). Wright-Patterson AFB, OH: Air Force Research Laboratory. ▪ Task, H. L., & Pinkus, A. R. (2003) Accuracy of NVG Objective Lens Focusing Using Artificial Objects, Natural Objects & the Hoffman 20/20 Tester. SAFE Journal Vol 31 (1). ▪ Task, H. L., Pinkus, A. R., Barbato, M. H., & Hausmann, M. A. (2003). Night Vision Imaging System Lighting Compatibility Assessment Methodology. FAA Aviation Maintenance, General Aviation, & Vertical Flight Human Factors. Washington D.C.
▪ Pinkus, A. R., Task, H. L., Barbato, M. H., Hausmann, M. A., & Dixon, S. A. (2003). Aerospace Transparency Research Compendium. (AFRL-HE-WP-TR-2003-0084). Wright-Patterson AFB, OH: Air Force Research Laboratory. ▪ Pinkus, A. R., Task, H. L., Dixon, S., Barbato, M., & Hausmann, M. (2003). 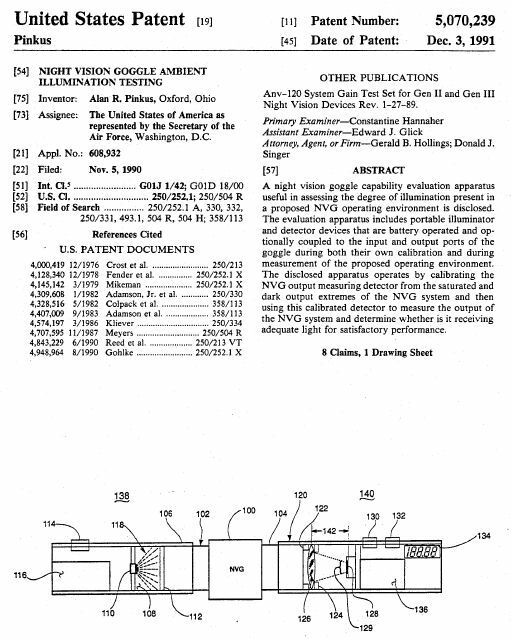 Twenty-Plus Years of Night Vision Technology: Publications & Patents from the Crew System Interface Division of the Air Force Research Laboratory at Wright-Patterson Air Force Base, Ohio. (AFRL-HE-WP-TR-2003-0048). ▪ Pinkus, A. R., Task, H. L., & Dixon S. A. (2003). Transmissivity & Night Vision Goggle Compatibility Data for Select Aircraft Transparencies. (AFRL-HE-WP-TR-2003-0015). Wright-Patterson AFB, OH: Air Force Research Laboratory. ▪ Pinkus, A. R., & Hausmann, M. A. (2003). Interlaboratory Study (ILS) For ASTM F 428-83, The Standard Test Method For Intensity Of Scratches On Aerospace Glass Enclosures. (AFRL-HE-WP-TR-2003-0012). Wright-Patterson AFB, OH: Air Force Research Laboratory. ▪ Pinkus, A. R., & Hausmann, M. A. (2003). Interlaboratory Study (ILS) For ASTM F 548-01, The Standard Test Method For Intensity Of Scratches On Aerospace Transparent Plastics. (AFRL-HE-WP-TR-2003-0009). Wright-Patterson AFB, OH: Air Force Research Laboratory. ▪ Pinkus, A. R., & Task, H. L. (2001). Interlaboratory Study (ILS) of the standard test method for measuring grid line slope (GLS) in aerospace transparencies. (AFRL-HE-WP-TR-2001-0104). Wright-Patterson AFB, OH: Air Force Research Laboratory. ▪ Pinkus, A. R., Task, H. L., & Marasco, P. L. (2001). Aircraft Canopy Laser Porthole. AFRL Technology Horizons, 2(1). ▪ van Schoor, M., Lengyel, A., Murray, S., & Pinkus, A. R. (2001). Breakaway Helmet Mount for Night Vision & Targeting Displays. (AFRL-HE-WP-TR-2001-0056). Wright-Patterson AFB, OH: Air Force Research Laboratory. ▪ Pinkus, A. R., & Task, H. L. (2000). Night Vision Goggle Objective Lens Focusing Methodology. SAFE 38th Symposium Proceedings. ▪ Pinkus, A. R., Task, H. L., Dixon, S., & Goodyear, C. (2000). Reproducibility of Night Vision Goggle Visual Acuity Measurements Using Landolt C's. Proceedings 21st Annual Lasers on the Modern Battlefield Conference at Brooks AFB TX, pp. 245-248. ▪ Pinkus, A. R., Task, H. L., Dixon, S., & Goodyear, C. (2000). Reproducibility Limits of Night Vision Goggle Visual Acuity Measurements. SAFE Journal, 30(1). ▪ Pinkus, A. R., Task, H. L., Dixon, S. A., & Goodyear, C. D. (1999). Reproducibility of Night Vision Goggle Visual Acuity Measurements Using Landolt C's. SAFE Symposium Proceedings 1999. 37th Annual Symposium. ▪ Pinkus, A. R., & Task, H. L. (1998). Measuring observers' visual acuity through night vision goggles. SAFE Symposium Proceedings 1998. 36th Annual Symposium, pp. 1-11. ▪ Marasco, P. L., Pinkus, A. R., & Task, H. L. (1998). Photographic assessment of dark spots in night vision device images. SAFE Symposium Proceedings 1998. 36th Annual Symposium, pp. 20-25. ▪ Pinkus, A. R., & Task, H. L. (1998). Interlaboratory study (ILS) of the standard test method for measuring the night vision goggle-weighted transmissivity of transparent parts. (AFRL-HE-WP-TR-1998-0016). Wright-Patterson AFB, OH: Air Force Research Laboratory. ▪ Pinkus, A. R., & Task, H. L. (1998). Interlaboratory study (ILS) for the determination of the angular displacement of multiple images in transparent parts. (AFRL-HE-WP-TR-1998-0011). Wright-Patterson AFB, OH: Air Force Research Laboratory. ▪ Standard test method for measuring the night vision goggle-weighted transmissivity of transparent parts F 1863-98 (10 April 1998). American Society for Testing & Materials Committee F-7 on Aerospace & Aircraft. ▪ Pinkus, A. R., & Task, H. L. (1997). The effects of aircraft transparencies on night vision goggle-mediated visual acuity. SAFE Symposium Proceedings 1997. 35th Annual Symposium, pp. 93-104. ▪ Pinkus, A. R., & Pantle, A. J. (1997). Probing visual motion signals with a priming paradigm. Vision Research, 37(5), 541-552. ▪ Reising, J. D., Grable, C., Stearns, S. M., Craig, J. L., & Pinkus, A. R. (1994). Night vision imaging system lighting compatibility testing of a production C-130H3 aircraft. (AL/HR-TR-1994-0166). Human Resources Directorate, Mesa AZ. ▪ Pinkus, A. R. (1994). The spatiotemporal characteristics of visual motion priming. (AL/CF-TR-1994-0084). Wright-Patterson AFB, OH: Armstrong Laboratory. ▪ McCarthy, J. E., Pantle, A. J., & Pinkus, A. R. (1994). Detection & direction discrimination performance with flicker gratings in peripheral vision. Vision Research, 34, 763-773. ▪ Pantle, A., Strout, J., Pinkus, A., & Jiang, Y. (1993). Some competing motion phenomena & their constraints on motion models. Investigative Ophthalmology & Visual Science, 34(4), 1364. (No. 3267). ▪ Pinkus, A. R. (1993). The spatiotemporal characteristics of visual motion priming. Dissertation Abstracts International, 53, 11B. PhD Dissertation. ▪ Pantle, A., Pinkus, A., & Strout, J. (1992). Motion signal interactions. Investigative Ophthalmology & Visual Science, 33(4), 973. (No. 1406). ▪ Pantle, A., Pinkus, A., & McCarthy, J. (1991). The puzzling influence of high spatial frequencies on motion perception. Investigative Ophthalmology & Visual Science, 32(4), 892. (No. 1096). ▪ Pantle, A., McCarthy, J., & Pinkus, A. (1990). Detection of the spatial structure & motion of second-order stimuli. Investigative Ophthalmology & Visual Science, 31(4), 523. (No. 2574). ▪ Merkel, H. S., Task, H. L., Whiteley, J. D., LaPuma, P. T., Pinkus, A. R., & Block, M. G. (1990). The development of the Spaceborne Direct-View Optical System - SpaDVOS. (AAMRL-TR-90-016). Wright-Patterson AFB, OH: Armstrong Aerospace Medical Research Laboratory. ▪ Pinkus, A. R. (1988). Night lighting & night vision goggle compatibility. AGARD Lecture Series 156: Visual Effects in the High Performance Aircraft Cockpit (pp. 7-1 to 7-16). Neuilly Sur Seine, France: NATO Advisory Group for Aerospace Research & Development. (NTIS No. AGARD-LS-156). ▪ Pinkus, A. R., & Task, H. L. (1988). Display system image quality. AGARD Lecture Series 156: Visual Effects in the High Performance Aircraft Cockpit (pp. 8-1 to 8-17). Neuilly Sur Seine, France: NATO Advisory Group for Aerospace Research & Development. (NTIS No. AGARD-LS-156). ▪ Task, H. L., & Pinkus, A. R. (1987). The role of the contrast sensitivity function in display image metrics. Electronic Imaging '87: International Electronic Imaging Exposition & Conference, 1, 161-166. ▪ Task, H. L., & Pinkus, A. R. (1987). Contrast sensitivity & target recognition performance: A lack of correlation. 1987 Society for Information Display International Symposium Digest of Technical Papers, 18, 127-129. ▪ Schiffler, R. J., & Pinkus, A. R. (1987). Human factors R&D requirements for future aerospace cockpit systems. IEEE Aerospace & Electronic System Magazine, 2(9), 2-4. ▪ Schiffler, R. J., & Pinkus, A. R. (1986). 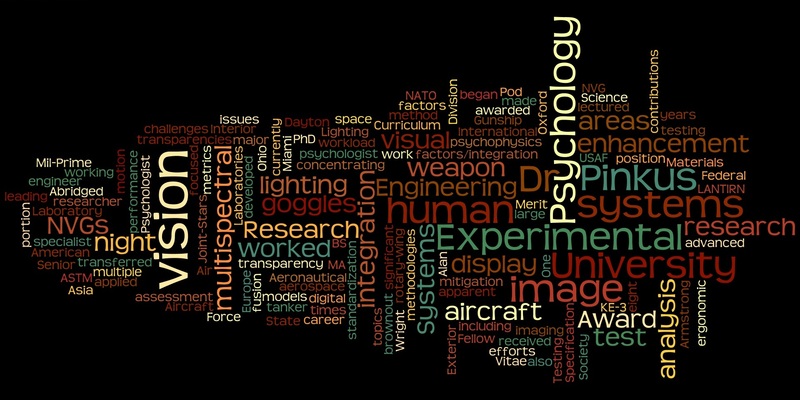 Human factors research & development requirements for future aerospace cockpit systems. Proceedings of the IEEE 1986 National Aerospace & Electronic Conference: NAECON 1986, 3, 883-885. ▪ Pinkus, A. R. (1985). Interior & exterior airborne lighting equipment. USAF Specification MIL-L-87240. ▪ Pinkus, A. R. (1982). The effects of color & contrast on target recognition performance using monochromatic television displays. (AFAMRL-TR-82-9). Wright-Patterson AFB, OH: Air Force Aerospace Medical Research Laboratory. Masters Thesis. ▪ Task, H. L., Pinkus, A. R., & Hornseth, J. P. (1978). A comparison of several television display image quality measures. Proceedings of the Society for Information Display, 19, 113-119. ▪ Task, H. L., Pinkus, A. R., & Hornseth, J. P. (1978). A comparison of several television display image quality measures. 1978 Society for Information Display International Symposium Digest of Technical Papers, 9, 32-33. ▪ Martin, W. L., Task, H. L., Woodruff, K. R., & Pinkus, A. R. (1976). Element density & percent active area design requirements for liquid crystal displays (AFAL-TR-75-235). Wright-Patterson AFB, OH: Air Force Avionics Laboratory. ▪ Spicuzza, R. J., Pinkus, A. R., & O'Donnell, R. D. (1974). Development of performance assessment methodology for the Digital Avionics Information System. (Final Report for the Period 1 Dec 73 - 30 Jun 74), Dayton, Ohio: Systems Research Laboratories, Inc.
My first patent while in graduate school at Miami U.